On October 24-26, 2017 European Secretariat for Cluster Analysis (ESCA) experts visited Kaluga Pharmaceutical Cluster to audit the cluster management system and evaluate the cluster’s business activities on the basis of 30 key indicators. The audit was carried out pursuant to European Cluster Excellence Initiative evaluation method. Over 70% of Kaluga Pharmaceutical Cluster indicators were significantly higher than the required values. This confirms the fact that the cluster has a very efficient management system and its performance is in line with world leading best practices. Irina Novikova, CEO, Kaluga Pharmaceutical Cluster Association, said: “The on-site audit has become a major development step for us based on a system approach applied by the cluster management team. At the stage of documents’ preparation and throughout the audit period our cluster members fully supported us and demonstrated their interest in the cluster performance improvement. This is a proof that we have selected the right cooperation approach. The fact that we received the silver certificate proves that the cluster has a management system, and demonstrates its efficiency, especially to our foreign partners”. According to Ivan Glushkov, Chairman of the Board, Kaluga Pharmaceutical Cluster Association, Kaluga Pharmaceutical Cluster holds the 9th silver certificate in Europe (among pharmaceutical/medical clusters) and the first in Russia thanks to good work of the cluster team. Kaluga Region Government support makes it even more efficient. 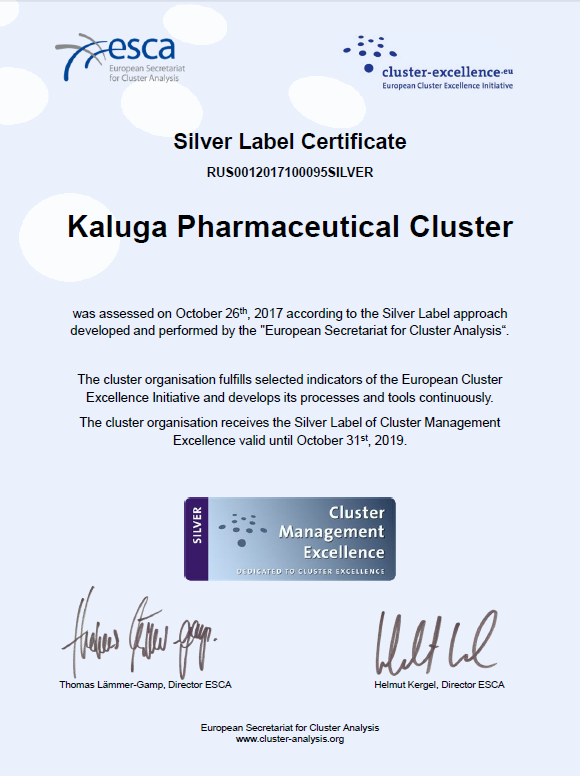 Anatoly Sotnikov, Director, Agency for Innovative Development – Center for Cluster Development of Kaluga Region, said: “The silver certificate of Kaluga Pharmaceutical Cluster is an outstanding achievement and, definitely, a benchmark. This is the first Russian cluster managing to reach such a high level. It joined the club of the best European clusters, paving the way for other regions. Great job! I would like to thank the cluster’s board and participants for such an outstanding result. Kaluga Region is proud of the achievement as it creates new incentives for Kaluga region clusters and clusters from around Russia”. European Secretariat for Cluster Analysis (ESCA) (headquartered in Berlin, Germany) has audited over 750 clusters under European Cluster Initiative since 2008. Only five Russian clusters have received bronze certificates in the recent two years. Kaluga Pharmaceutical Cluster was benchmarked against the leading European clusters from the same economy sector. It was evaluated by 30 key indicators.